Just a week after their last match together a quirk in the way the playoffs fell meant Pakistan faced off against India again in the IC17 Men's Division final round. The tone of the match was set by the traditional rivalry between Pakistan and India that we typically see on the cricket pitch. In this case they have swapped the bat and ball for an oval shaped ball but the intensity and aggression was still evident during play. 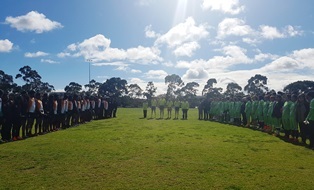 The teams' respective national anthems played as the sun shone down on them in what was calmer conditions compared to earlier that morning. The Pakistan Mens Shaheens were joined by the Women Shaheens for the national anthem which added a unified addition to their line up. Pakistan came out in dominant fashion in the first quarter, they constantly launched the ball forward, deep into their forward 50m and their roving from ruck contests was at a semi-elite level, proving that they also dominated hitouts as well as possession. The first goal of the match came against the run of play with India’s Darius Fernandes (#12) being awarded a free kick for a push in the back 15m out, directly in front. India looked very controlled with their ball movement in contrast to Pakistan’s getting it forward at all cost, which finally paid off with two goals coming from their impressive roving skills from Kashif Khan (#7) and Takashi (#35) both snapping for goal and using the breeze to their advantage. 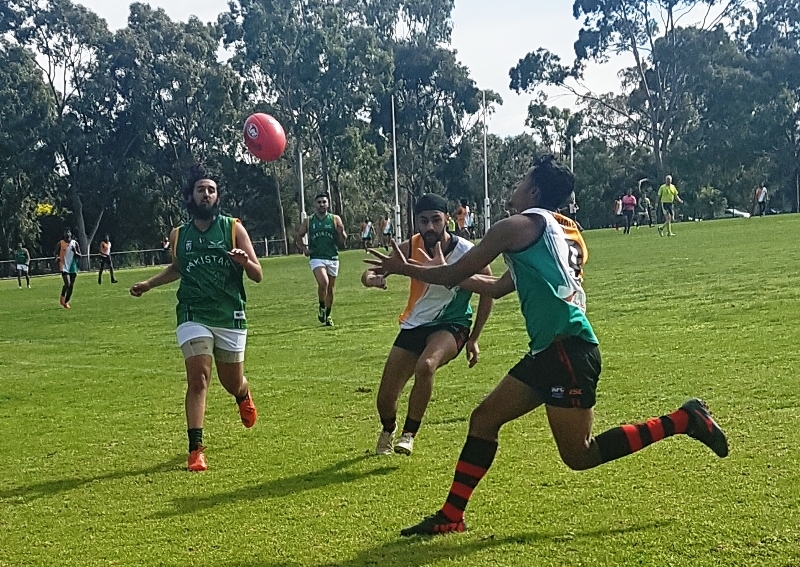 Whilst in the last two minutes of the quarter Muqeet Qureshi (#4) pounced on the loose ball in the forward pocket, wheeled around and snapped a bouncing goal on his right boot. 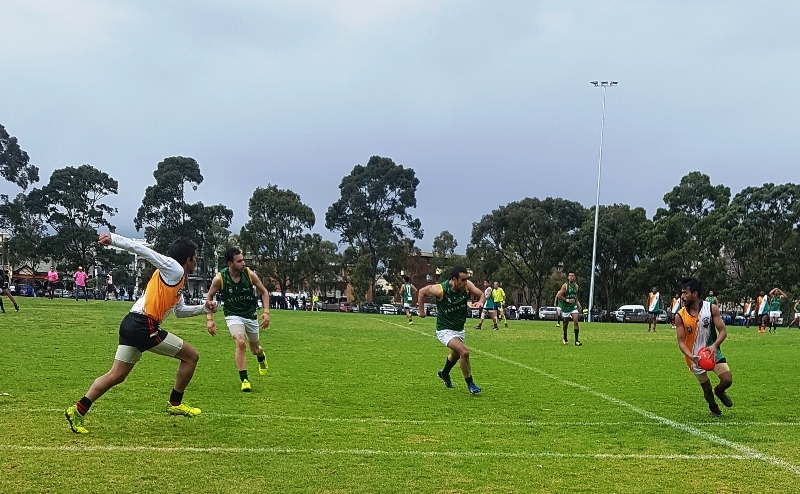 The Bombers were instructed to start the second quarter with more forward leads and structure, utilising their skills and to lock it in their forward half with good pressure. Which unfortunately did not work out for them as Pakistan started the second quarter where they left off in the first, piling on another three goals in the quarter, Zaheer Hussain (#3) slotting a great goal from the boundary line roughly 20m out, Nawid Najafi (#15) snapping a goal from the back of the pack 30m out bouncing through the goal posts and Haseeb Qureshi (#1) being awarded a free kick on a slight angle 30m in which he scored with ease. Pakistan also had quite a few missed opportunities in which they should have capitalised and extended their margin. The only consolation prize for India was Darius Fernandes (#12) being awarded a holding free kick in the goal square, in which he converted to give him his second goal for the match. After an epic spray from a leadership player for their undisciplined free kick count, Pakistan players were told to man up and not be drawn into unnecessary free kicks. Shortly after Melbourne turned on its typical ‘four seasons in a day’ weather routine and what started off as calm conditions at the beginning of the match soon turned into horrible, wet and windy conditions. With the rain coming in sideways and the wind feeling incredibly icy both teams started to struggle with their skills as they were clearly not use to wet weather conditions. Eventually a switch flicked and many players saw the best way forward was to kick the ball off the deck, which is where it was for most of this quarter. 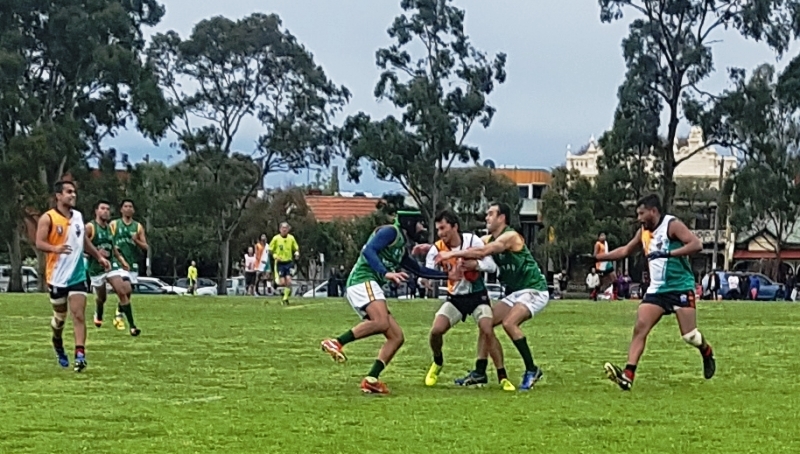 Although Pakistan looked promising moving forward at times, neither team managed a goal, the Melbourne weather had defeated them both. The final quarter was very similar to the third, with the elements proving too much for both the Shaheens and the Bombers. Combined with the pressure and fatiguing bodies, the ball was too slick to handle with a lot of dropped marks and fumbles at ground level. The fire had not gone out of the sides though, with numerous niggly scuffles at stoppages occurring as tensions rose high. 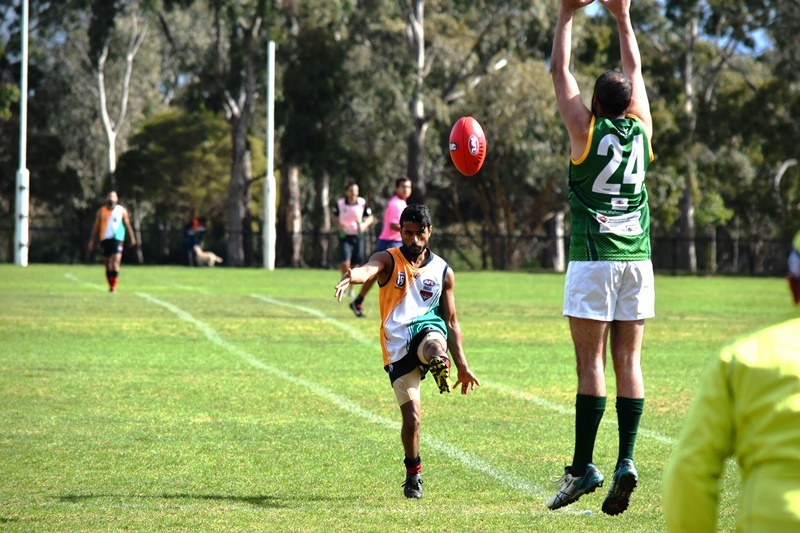 Team India started to show their frustration as they knew it would be a too hard a task to kick four goals in one quarter with the conditions they had to face. Their efforts were rewarded with two late goals, with Aashish Sharma (#5) paddling the ball forward then wheeling back on himself snapping a great goal and Akash Malhotra (#44) getting his first goal of the match. India can take consolation in winning the last quarter in tough conditions but Pakistan proved too strong in the first half and there was no catching them, doubling up on their victory a week earlier.